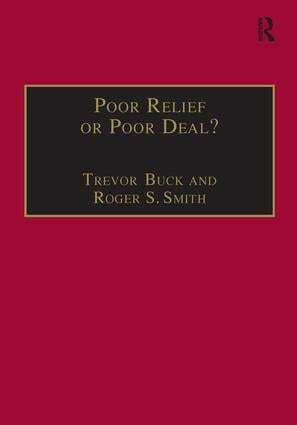 Poor Relief or Poor Deal? The social fund has been a controversial instrument of social policy in the UK since its introduction in 1988. This book brings together new research and debate on the role and effect of the social fund in relieving poverty, and introduces evidence from the wider European field to allow comparison to be made with other countries' experience of providing a 'safety net' for their poorest citizens. This book opens up for wider discussion the question of how to provide help for disadvantaged groups and individuals at times of financial crisis. Addressing practical questions about how such schemes work (or fail to work) effectively, the book also provides the basis for more general consideration of the overall objectives which they are expected to meet. This will contribute to new thinking about the policy goals of the social fund and other emergency payment schemes, and their role in meeting broader aspirations such as cohesion, inclusion and social justice. Contents: The Historical and Political Context: Lump sum and emergency payments: a brief history, Gary Craig; Social assistance in Belgium: public centres for social welfare, Koen Hermans and Anja Declercq; Balancing the books: the social fund in action, Gary Craig; Politics, social justice and the social fund, Roger S. Smith. Meeting Exceptional Needs in Practice: Claimants, applicants, customers or supplicants?, Roger S. Smith; Decision-making processes, Mike Rowe; Safety nets and trampolines: the implementation of exceptional need provision in Britain and the Netherlands, Jacqueline Davidson; Undoing the damage: review processes, Trevor Buck. The Prospects for Reform: Making it better? the impact of reform, Sharon Collard; Achieving policy goals, Beth Lakhani; Discretionary assistance to the poor: the case of France, Anne Daguerre and Corinne Nativel; A better deal: the propects for reform, Trevor Buck and Roger S. Smith; Bibliography; Index. Cash benefits and care services together make a fundamental contribution to human welfare. This series, published in association with the Social Policy Research Unit at the University of York, is designed to inform public debate about these policy areas and to make the details of important policy-related research more widely available.